Looking for an unusual house plant? 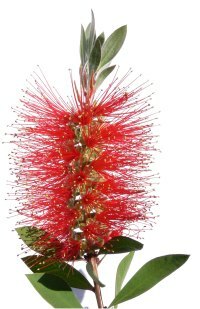 Bottle Brush Plant is sure to grab attention -- and admiration -- from all who see it. It's also attractive to butterflies and hummingbirds, if you choose to put it on your porch or patio for the summer. Given enough light, the Bottle Brush Plant will produce upright flower spikes in spring and summer. It doesn't actually have petals. Each "bottle brush" flower is made up of bright-red stamens with yellow tips, clustered on flower spikes up to 4 in (10 cm) long. At the top of each fuzzy spike is a tuft of leaves. Each woody stem is covered top to bottom with long, narrow leaves. The dark-green leaves are pointed at the tips and grow upward, giving this captivating plant a lean, elegant look. They have a fragrant, lemony scent, giving this plant another common name: Lemon Bottlebrush. An Aussie native, this evergreen shrub will do best with bright sun, warm temperatures and dry air. Give it good care, and it will become a fairly large shrub. However, you can keep it compact with regular pruning. Dwarf bottle brush makes a good container plant. 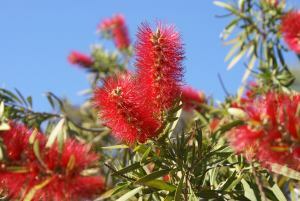 Callistemon citrinus 'Little John' is a dwarf bottle brush variety, reaching only 3 ft (90 cm) tall. Let it bask in the sun. It'll make an easy indoor plant, if you can provide the sunlight it needs to grow. Place it directly in front of a sunny window. Or, move your plant outdoors for the summer, if you want. Just be sure to bring it back inside when the nighttime temperature drops to 45°F/7°C. This plant won't tolerate the cold. Prune it. Immediately after flowering, cut the plant back by half to keep it compact. Use sharp pruners to avoid tearing at the stems, which can harm the plant. Give it a rest. Callistemons need a winter rest. Keep the plant in a cool place (with a minimum of 45°F/7°C). Cut back on watering during this time, keeping the soil only slightly moist. Repot in spring. 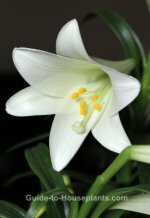 This plant blooms best when slightly pot-bound, so move it to a slightly larger pot only every couple years or when needed. When the plant reaches the size you want, you can keep it small by repotting it in the same container, just to refresh the soil. Light: Full sun. Plants that don't bloom aren't getting enough light. Give Bottle Brush Plant as much light as you can year-round. A sunroom or a sunny spot directly in front of a window is ideal. Water: Water thoroughly spring through fall and allow the soil to dry out between waterings. Cut back on watering in the winter, while the plant is resting. It's drought-tolerant, so if in doubt about watering, keep it on the dry side. Temperature: Average room temperatures 60-75°F/16-24°C. It's hardy in USDA Zones 9-10, so it can take the summer heat. Give it a cool rest in winter with a minimum temperature of 45°F/7°C. Soil: Well-drained soil. Use 2 parts potting mix and 1 part sharp sand. Fertilizer: Feed monthly spring and summer with high-potassium liquid fertilizer diluted by half. Propagation: Take 3 in (7 cm) stem tip cuttings in spring or early summer. Can also be sown by seed in spring.